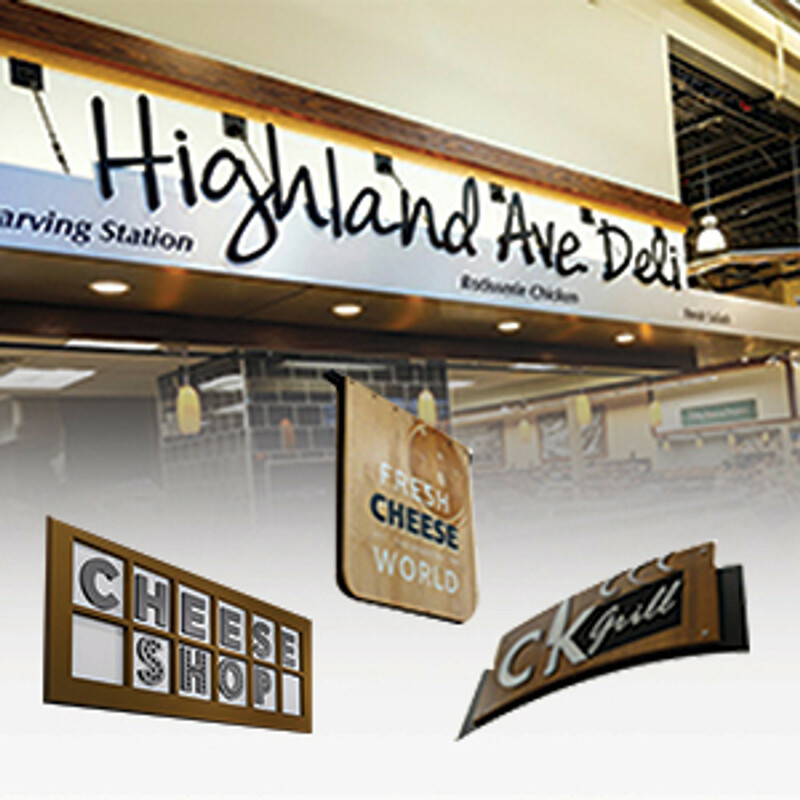 When designing supermarkets, mall or grocery store floor plan layouts retail architects and store designers often specify the use of hanging aisle signage. They are generally hung above the gondola shelving or retail floor displays. They provide shoppers with directional way finding in the store so that people can locate what they are shopping for. 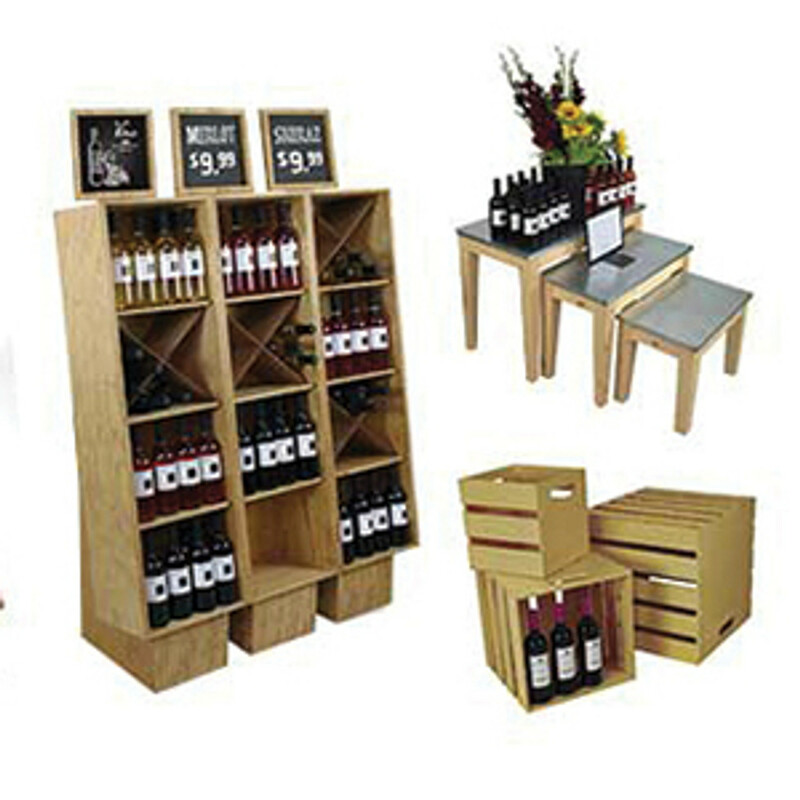 Supermarket interior design specialists and those who are involved in small store design all have the same design issue. How to allow the customer or shopper to be able to find small products in an environment where there are so many things competing for your attention. 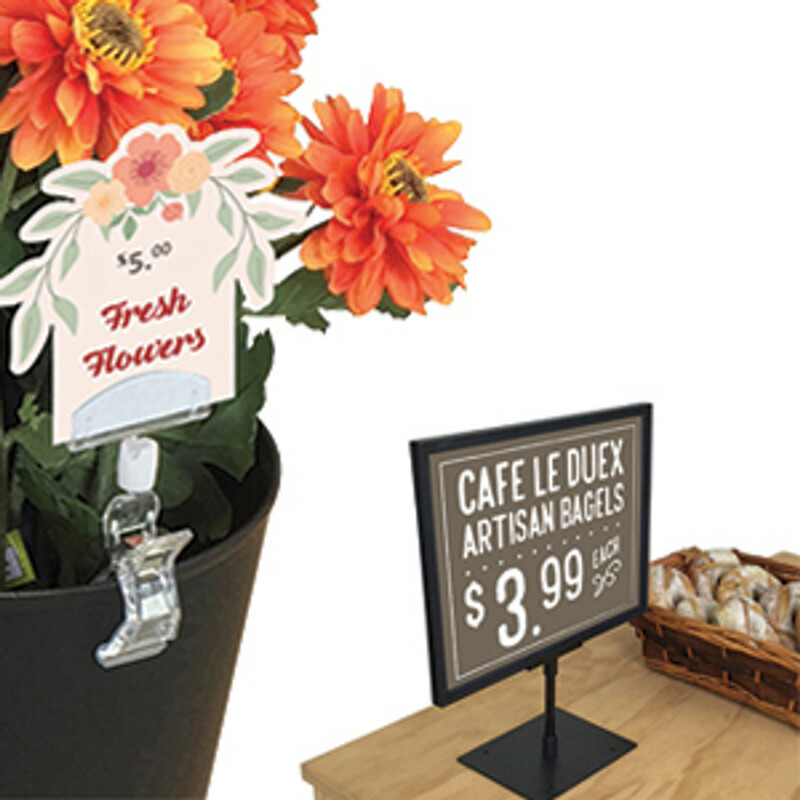 In a typical grocery store layout the store planners and designers can help shoppers in this task be utilizing hanging aisle signs or hanging aisle markers. 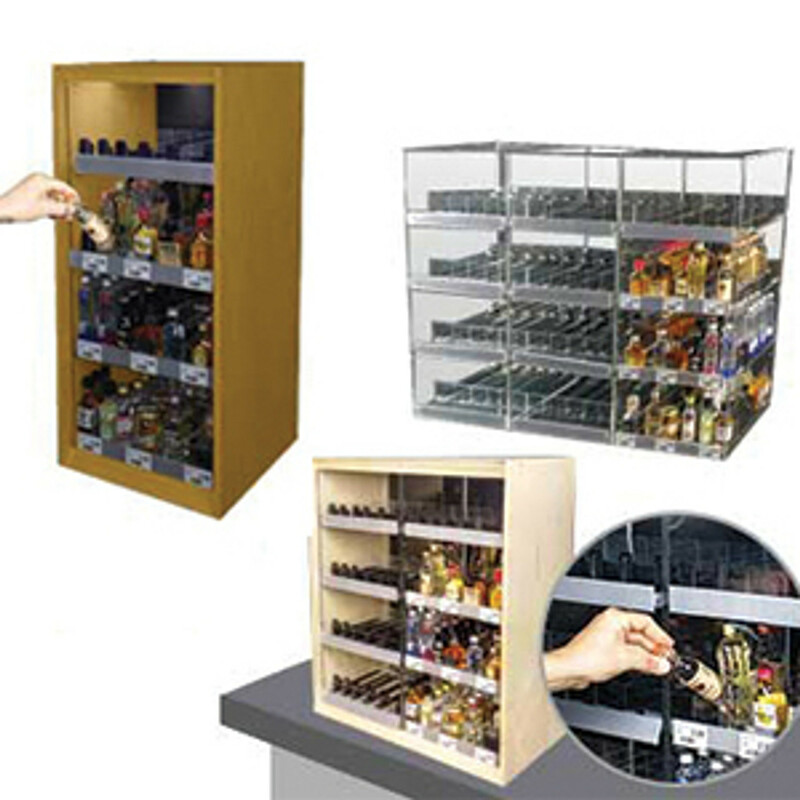 Retail business management consultants believe that a well designed in store signage layout helps the store’s customers to locate food, bottles and products on the shelf. 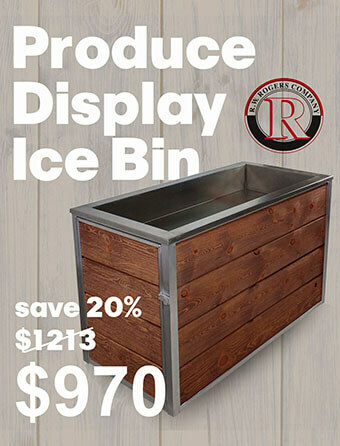 It also serves as a great place to advertise the store’s brand message or marketing theme. 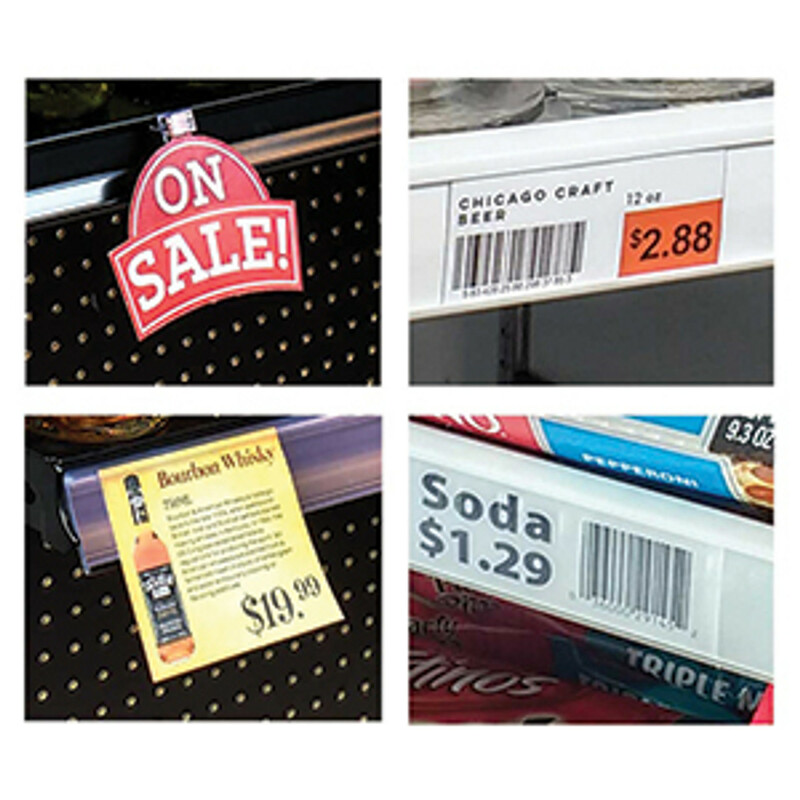 Those who are interested in cross merchandising or food displays can use hanging signs to remind customers that the items their looking for has associated products that go with it. 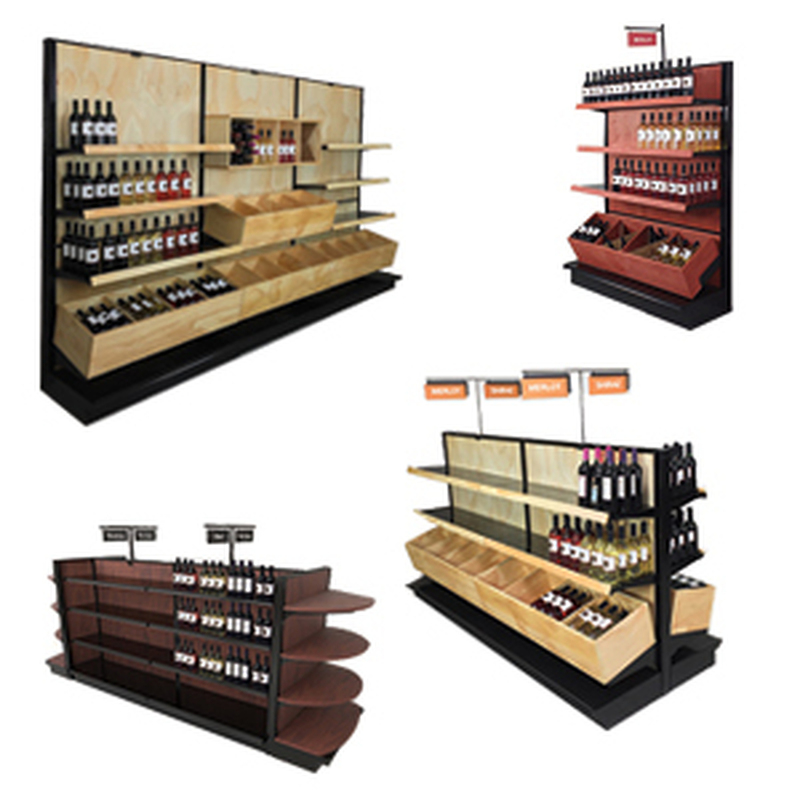 The cross merchandising aspect of retail signage displays are an awesome way to increase incremental sales at the point of purchase. 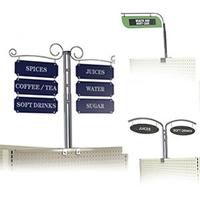 Warehouses and factories are also frequent end users of hanging location signs and rack mounted signs or aisle markers. Operations managers, architects or logistics managers usually specify them on plant floor plan layouts. In this case the signs are suspended from the warehouse ceiling and are used to detail the items found in inventory in each aisle or bay location of the pallet racking. They are sometimes called warehouse signs or safety signs. 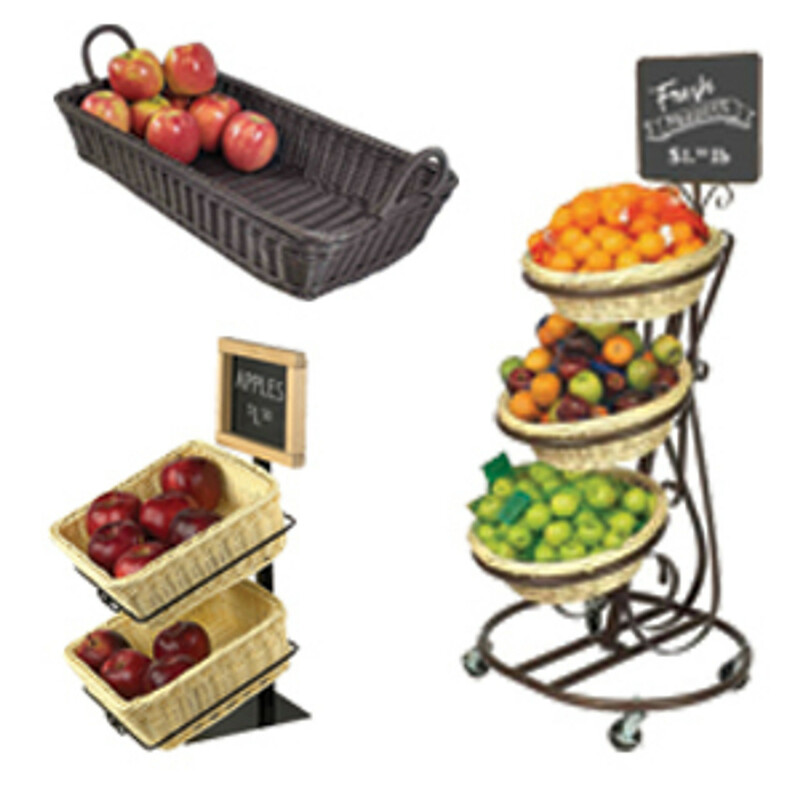 For aisle signs in warehouses DGS Retail is your low cost design and supply source. 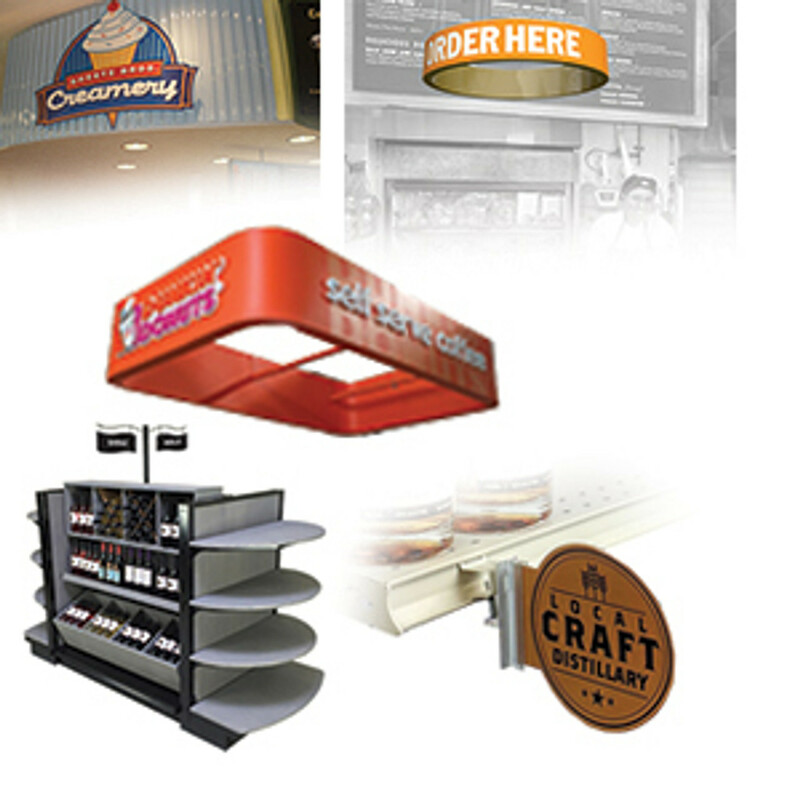 DGS Retail offers a large assortment of hanging sign designs. The designs range from vintage signs to modern and are printed in a rainbow of colors and wood grains. The signs are custom designs that are bought online. The retail signs are specially engineered to be suspended from the ceiling. 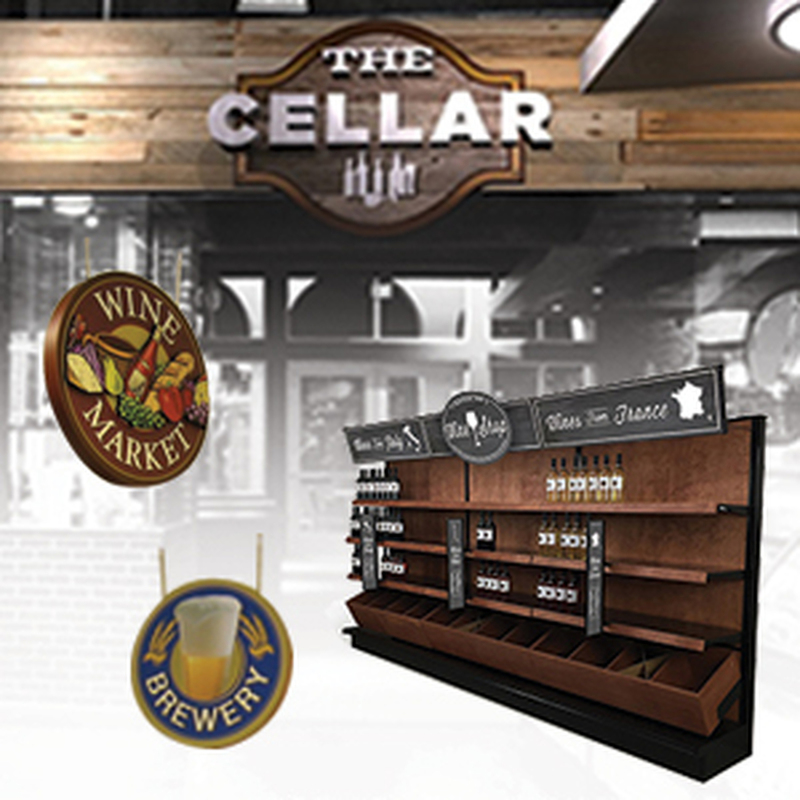 Store fixture or warehouse rack mounted sign designs are available too. The hanging aisle markers can be hung from drop ceiling grids or architectural acoustical ceiling tile T bars. They also can be installed by hanging them from exposed ceiling trusses or joists if no ceiling grid exists. 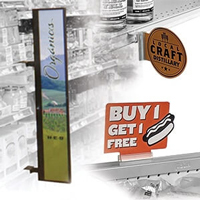 DGS Retail also makes gondola aisle sign holders that attach direct to gondola shelves. Custom Printed - Order Online! DGS Retail’s signs are ordered online and are custom printed with your choice of colors, added store logo or message and interchangeable inserts. 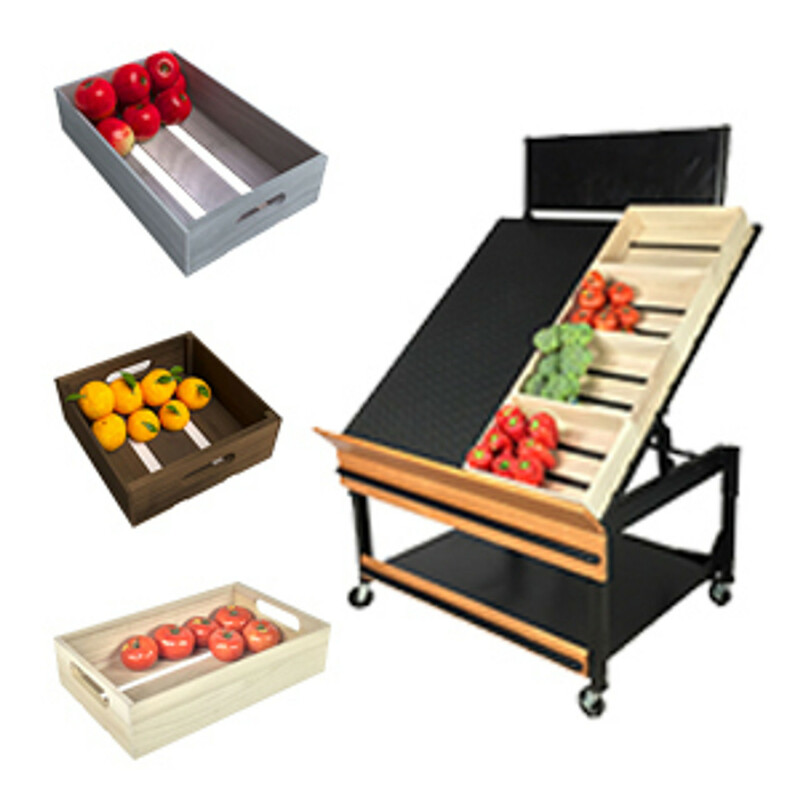 The inserts are included with the sign and can describe the types of products or items that can be found on the gondola shelving or pallet racking underneath the signage. The inserts have custom copy that you choose and can be slid in and out of channels incorporated into the sign. This is important if you ever want to rearrange your store or warehouse. You can easily change the inserts on the hanging signs to reflect the new floor plan layout or gondola shelf planogram. The channels that the graphic sign inserts slides into are generally C channels or J channels depending on the sign design. We offer multiple sized hanging signs that will fit into almost any size interior space. 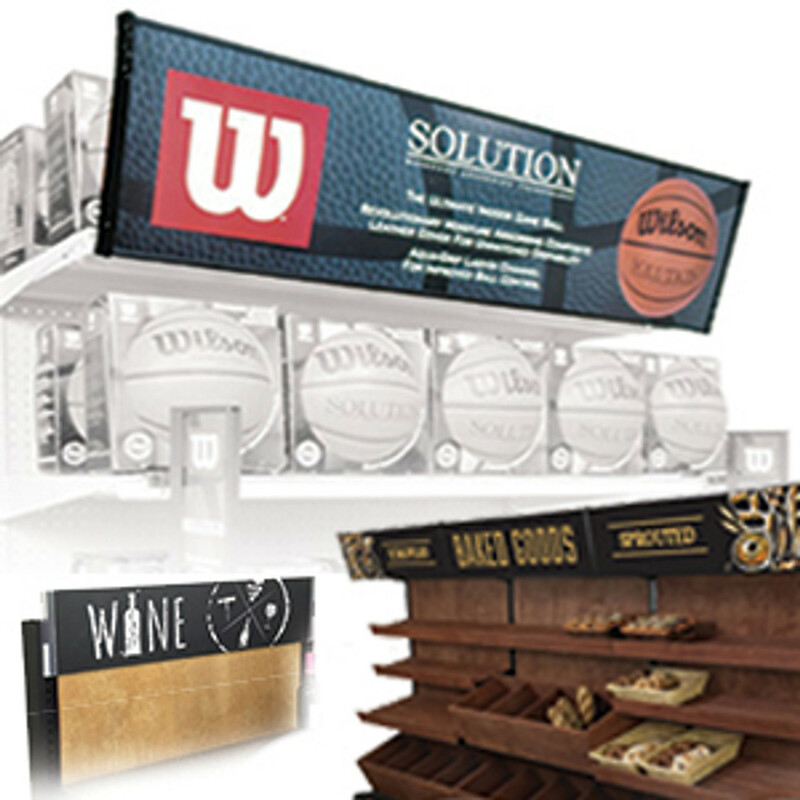 From small store design ideas to warehouse aisle signs there are many to choose from. 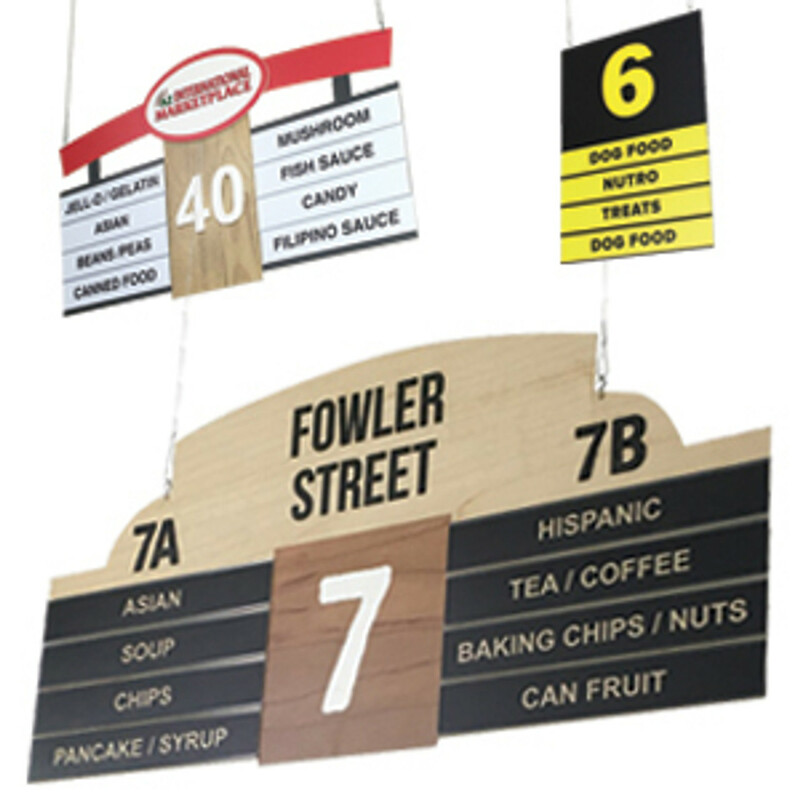 Once your order for hanging signs is placed online a DGS Retail signage specialist will call you to obtain your list of copy for the inserts and to go over the custom printing options that we have available. The aisle markers are constructed out of lightweight material that’s an engineered expanded vinyl material for years of worry free use. 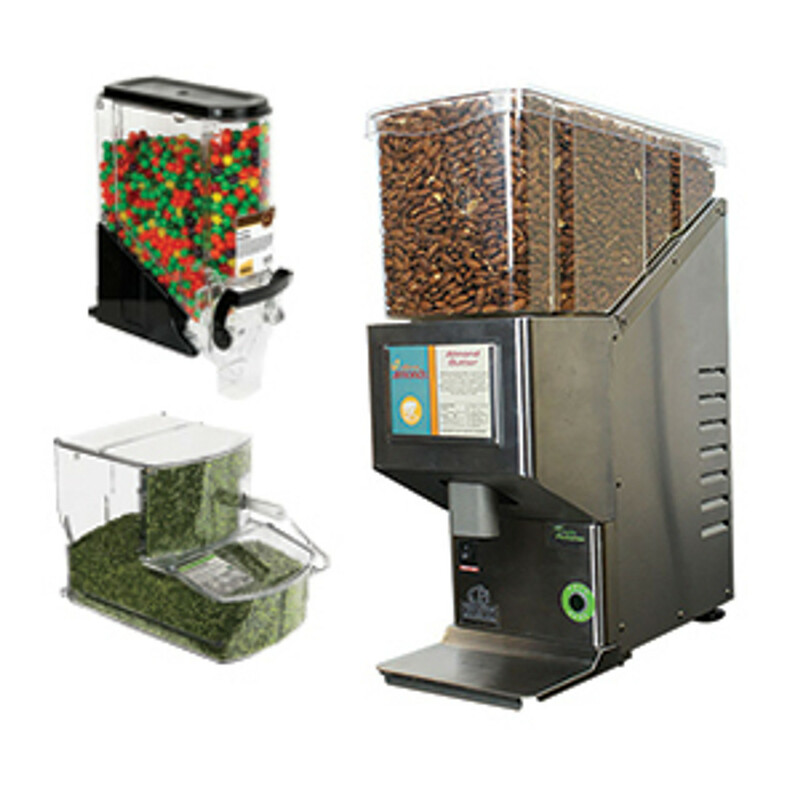 The signs can be ordered in almost any quantity from 1 to 1,000,000. 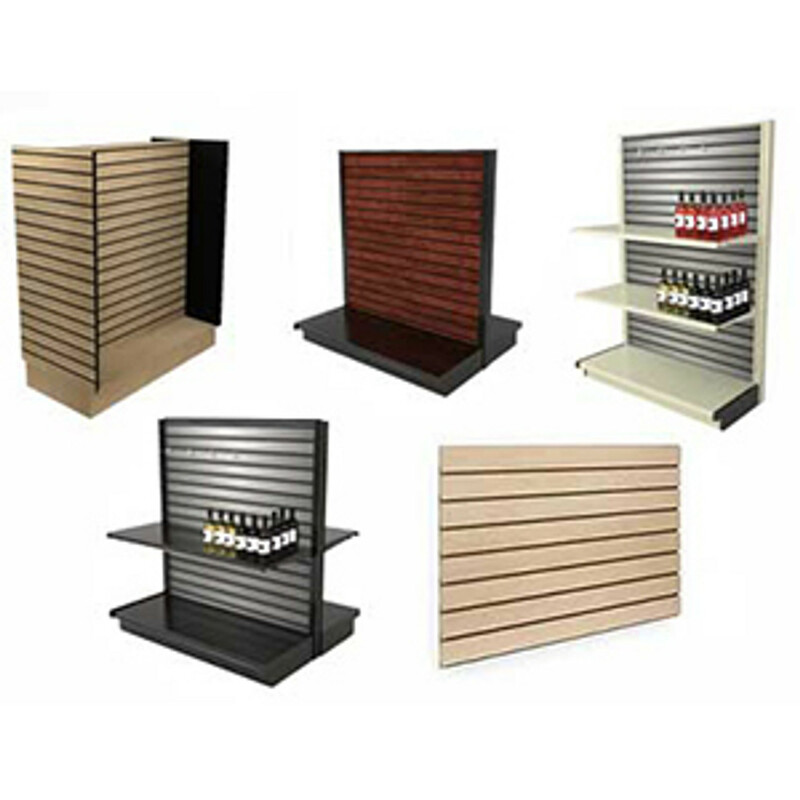 DGS Retail offers volume discounts, design services and even installation services. The hanging signage has holes incorporated for suspending the sign. The signs are hung with available sign hanging hardware. 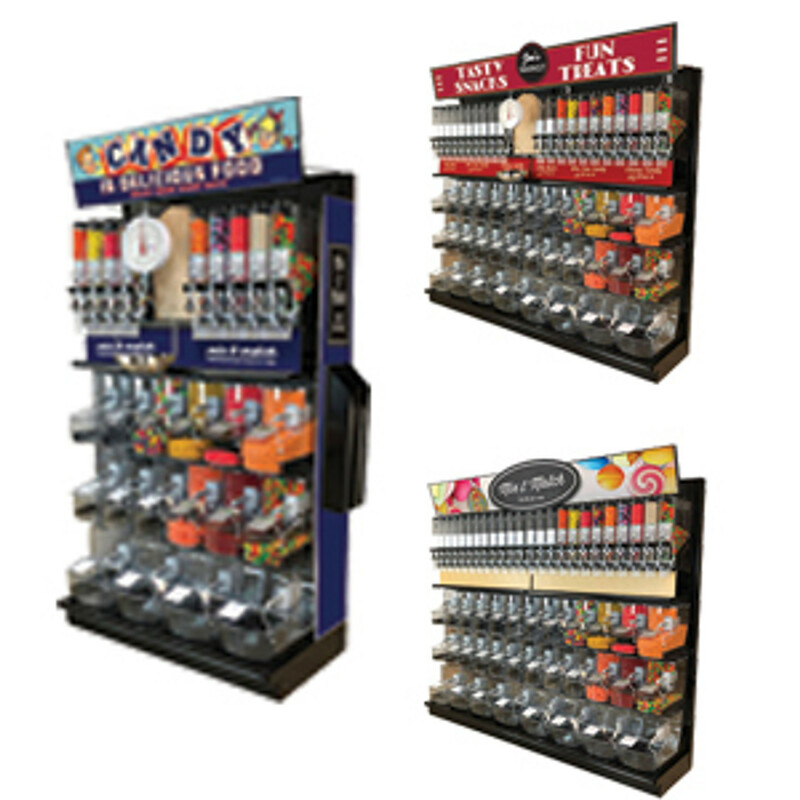 DGS Retail offers, ceiling grid clips, plastic clips, metal, hanging banner systems, hanging sign holders, sign clamps and all related sign hardware and brackets hanging. 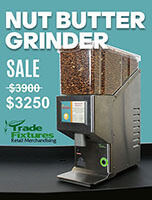 In addition to being your source for hanging signs and banners - let DGS Retail be your sign bracket store as well! Aisles are common in warehouses, factories, grocery stores, shops and other retail or storage areas. They generally have shelving to either side of the aisle. 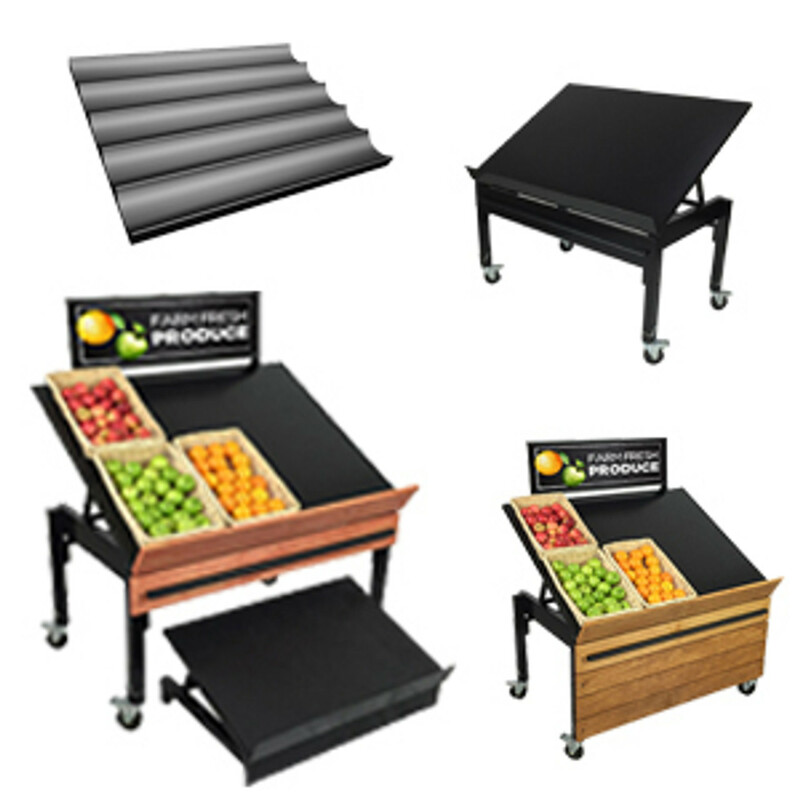 In warehouses or in factory aisles they are usually made up of the space between warehouse racking, pallet storage or between work areas. 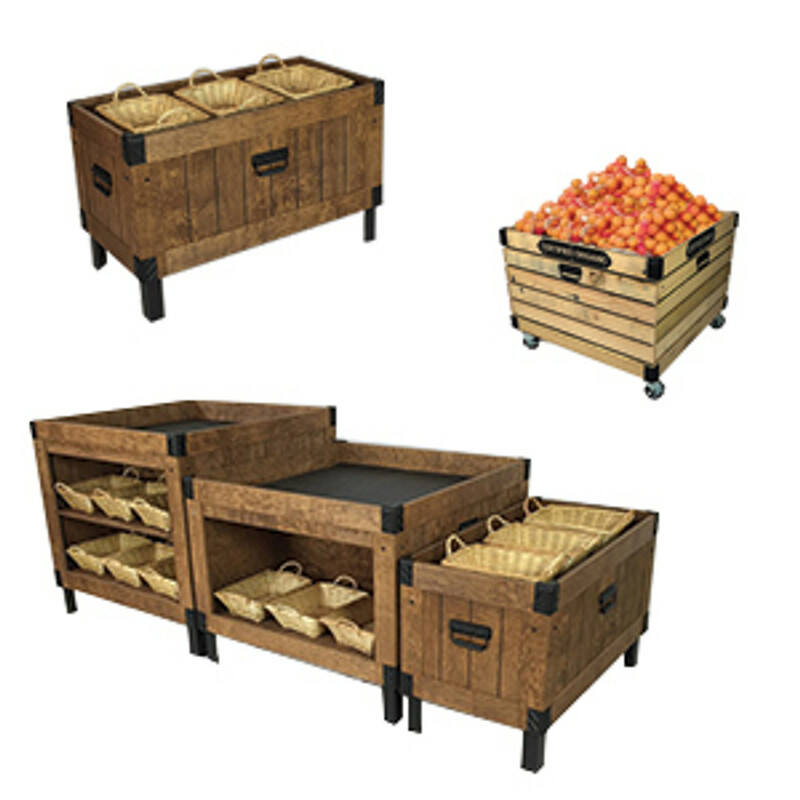 While in retail stores, grocery stores and supermarkets isles normally have gondola shelving or store shelving on their sides. Aisles are predominantly straight, long and rarely curved. In most grocery stores an aisle’s width is a minimum of 48” wide and often it is 6 feet or more if the aisle is part of the racetrack that goes around typical supermarket floor plans. The width of an aisle is determined by having enough space between the racking or shelving so that 2 or 3 people, potentially with carts, can stroll past each other without feeling crowded. Hanging aisle markers are normally placed above the gondola end caps or crown caps at the end of a store aisle run. In warehouse situations they are suspended at the entrance to aisles in a parallel position so that people, workers or forklift drivers can see them from down the main aisle. In grocery stores they are also placed parallel to the aisle that they reference. In a similar situation shoppers can then read them from a distance as the approach the aisle from down the perimeter main aisle that’s sometimes called a supermarket racetrack. Optimum reading distances should be considered when figuring out how large of an aisle sign will be needed.